This entry-level module offers multiple connectivity options such as Ethernet and dual USB 2.0. 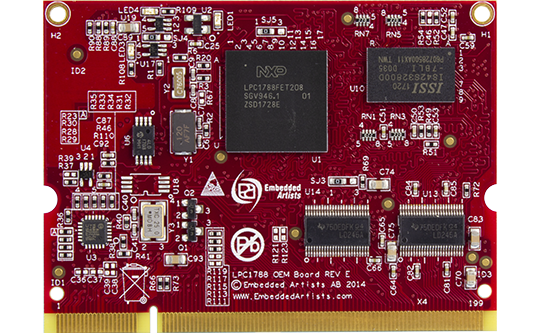 The LPC1788 is – despite being an entry-level product – the most advanced product in NXP’s LPC1700 family. It’s designed with an ARM based Cortex-M3 @ 120 MHz. The LPC1788 OEM board is available in industrial temperature range, -20 to +85 Celsius. The industrial (temperature range) version is suitable for always-on applications.